Day trip to the tomb. 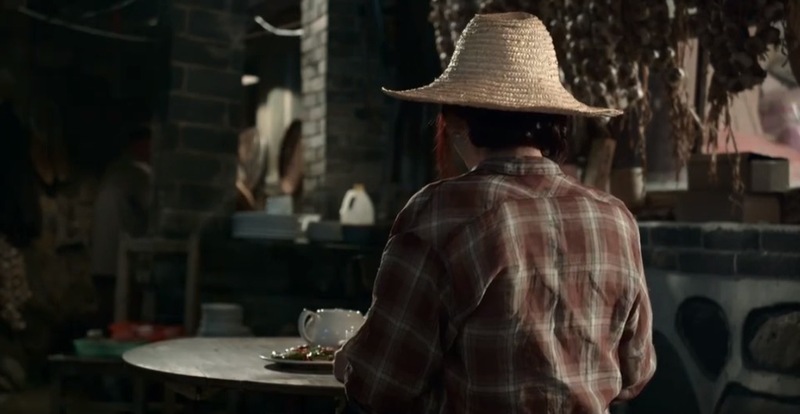 So we return to find Wu Xie talking to the creepy long haired ghost, asking her if she knows where his friends are. The ghost turns around to reveal that she has no face, just hair front and back. Wu Xie freaks himself out and closes his eyes in terror. When he opens them again, the ghost is within inches of his face and envelops him. Suddenly, Wu Xie awakes to find himself surrounded by Uncle Three and friends again. Apparently Uncle Three knocked him out when he turned around to look at the ghost. Uncle scolds him for risking everyone’s safety by doing what he was explicitly told not to do. 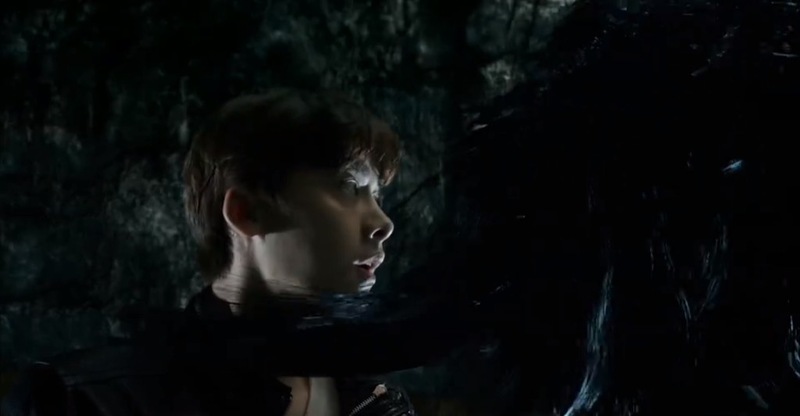 The ghost is called Lei, and she wants to use Wu Xie’s yang spirit to escape the cave. Eep. Pan Zi keeps rowing (poor guy, rowing an entire boat of men) and they anchor by a village. The group asks a little boy to lead them to a hotel, and the boy asks for fifty large. Dang, boy! He leads them to the only hotel in the village which appears to be pretty run down. Left with no choice, they decide to take the last two rooms to recoup for the time being. Wu Xie lays Xiao Ge down in bed and tries to peek at his mysterious weapon, but fails when Xiao Ge wakes up. Wu Xie excuses himself and meets everyone else for dinner. At dinner, a mystery woman starts talking to them and she turns out to be Chen Cheng Cheng! Uncle Three scolds her for a bit, but eventually agrees to bring her on the adventure. Chen Cheng Cheng tells everyone that she followed the criminals to this village because they are also after the tomb which is rumored to be that of a god’s. However, the tomb is now sealed off by the breaking of a dam years ago. What is strange is that they found over one hundred skulls nearby, just skulls, no bodies. Chen Cheng Cheng also tells them that a group of raiders tried entering the tomb at some point, but couldn’t find the entrance. yay she was not kidnapped! The next day, Uncle Three leads everyone on a trip to seek out the entrance of the tomb using their special map. After a bit of walking they spot the old man who led them into the cave earlier. You know, the one that tried to leave them for dead after taking their valuables? Yup, him. The old man sees them and immediately kneels down to beg for forgiveness, blaming the dead guy for the whole thing. Uncle Three is uninterested in his excuses, but is curious as to how the old man was able to escape. The old man reveals that there is a hole at the top of the cave. After they leave, he would blow a whistle and the dog would push a giant basin over for him. He would get in the basin and row away. Uncle Three asks the old man to be their guide, much to the old man’s horrification. On their way, the old man tells a story about how a group of people (the criminals) who asked him to be their guide a few days ago. Apparently they had set up camp not far from the tomb, but while he was sleeping, the group of people disappeared. When he woke up, he saw the woman of the group covered in blood, but nobody else. Because of this, the old man is convinced the tomb is haunted, but Uncle Three doubts the realness of the story. Finally, they arrive at the criminals’ campsite. Uncle Three deduces that the bad guys are in the cave already and have not vanished like the old man thought. Pan Zi grabs two canteens of gas and they set off for the tomb. Suddenly, High Shao falls into a shallow pit and everyone stops to observe. Xiao Ge breaks silence and states that this is the place. how did you miss that pit?! Uncle Three bents down to investigate and suggests they start digging. Wu Xie is unhappy with that because it will destroy the tomb. 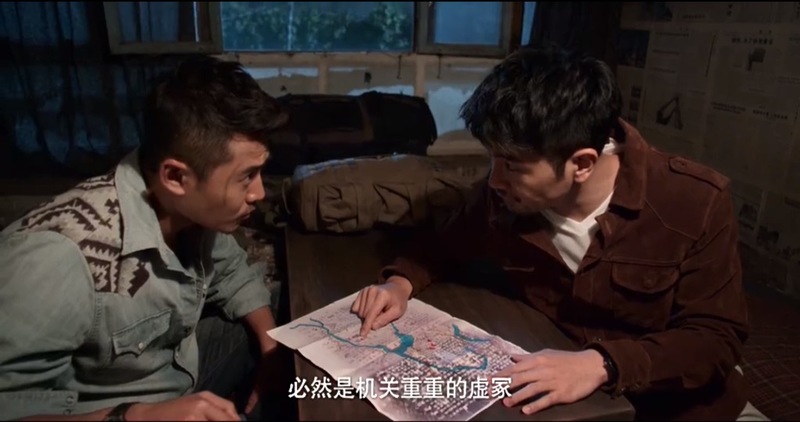 Xiao Ge points them to a heep not far off and Uncle Three identifies it as the result of an explosion, meaning the criminals are already in there, likely raiding as they speak. 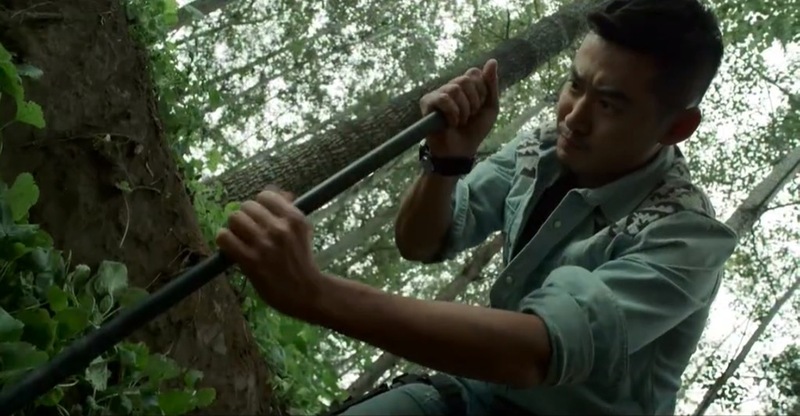 Wu Xie relents on the digging, but demands that he must enter the tomb, too. So the digging commences! 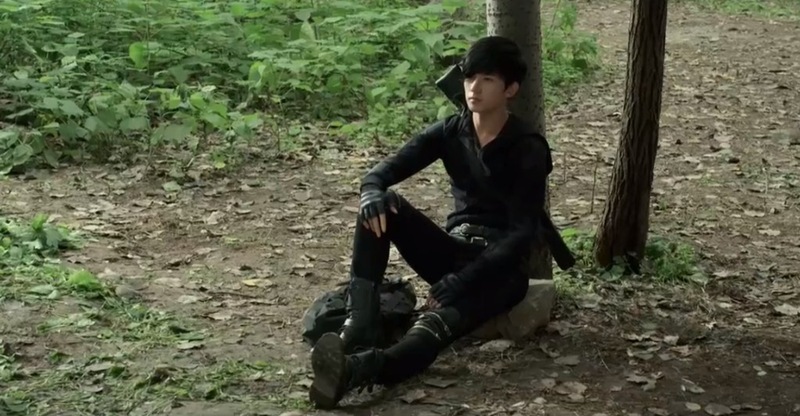 Or should I say, Pan Zi and Uncle Three dig while the rest of them watch… Xiao Ge just sits looking emo the entire time. 1, 2, 3, ho hum! Some time later, Pan Zi and Uncle Three both pull out their tools to find some red dirt. 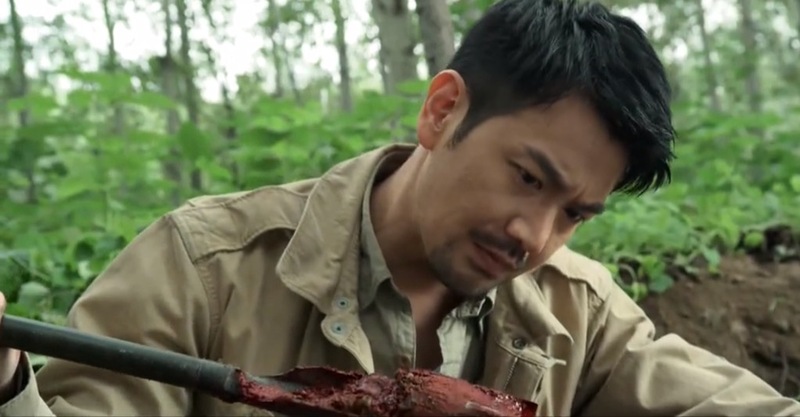 High Shao wonders why does it look like there is blood mixed in, but no one replies. So what does he do? 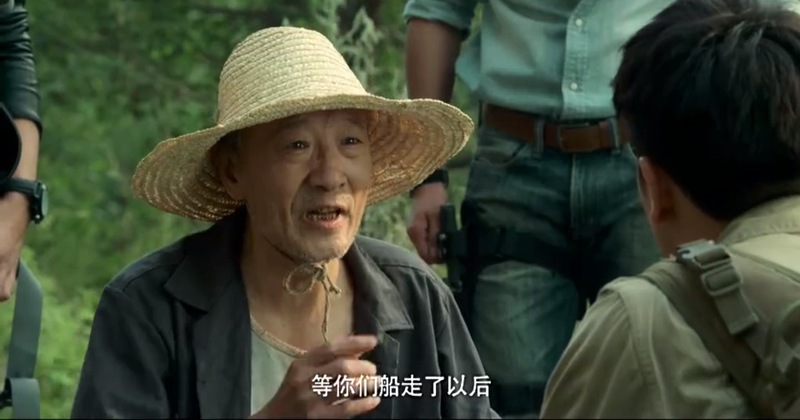 He happily goes off to build a tent with Chen Cheng Cheng. Man, their reactions or lack of reactions is totally absurd. i guess this is no big deal? Uncle Three and Pan Zi continue to dig and soon enough they find the entrance. High Shao decides that he will stay behind (of course) to protect Chen Cheng Cheng, but everyone else go ahead and enter. What all of them failed to realize is that the bad guys already found them. After descending a bunch of stairs our heroes find the door to the tomb blocked by a brick wall. This tomb is surprisingly bright, considering lots of lights shining on their walkway. I don’t know man, doesn’t seem like they need those flashlights to me! Uncle Three and Pan Zi each reach their hand in one of the two animal statues to press on some button to get the door to open. They descend down some more stairs to find yet another wall, this time with no special statues sitting outside on guard. 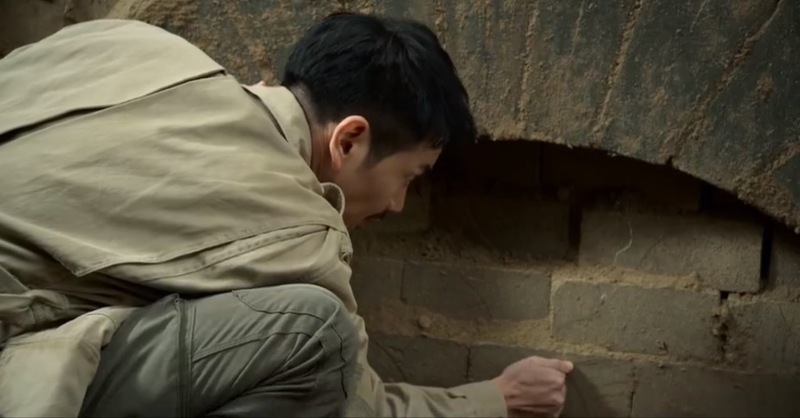 Just as Pan Zi is about to brute force it, Xiao Ge stops him and tells him that the bricks cannot be broken in, they must be pulled. Xiao Ge grabs hold of one of the bricks and pulls it out. He then inserts a tube to release the liquid inside the bricks. Apparently if they broke the bricks then the liquid would splatter all over them and effectively burn off their skin. 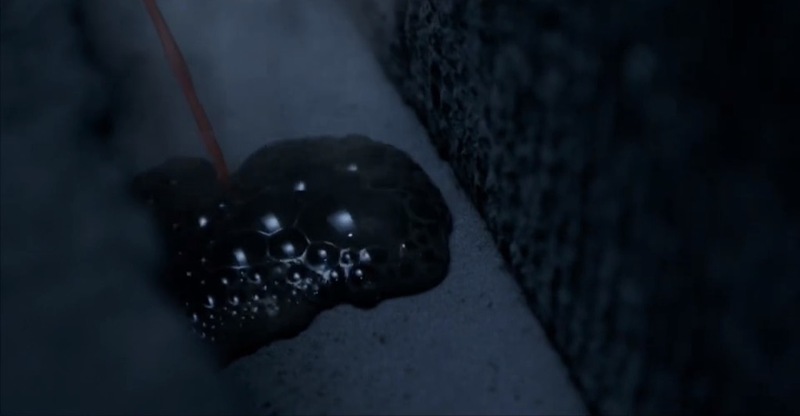 It’s weird though that Xiao Ge would elect to use a plastic tube to contain this super dangerous and hot liquid… hmmmmm. Uncle Three doesn’t let Wu Xie or High Shao drink alcohol, but once he turns away, Wu Xie spikes their Red Bull. 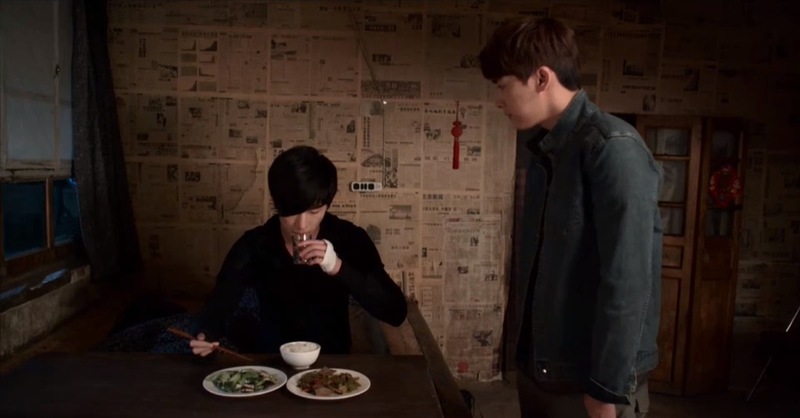 Wu Xie orders pork liver for Xiao Ge to help him rejuvenate his blood flow. High Shao thanks the little boy for being their guide, but the boy is only interested in money.